Today’s workforce is mobile and needs the ability to connect to coworkers and clients from any device that they have available to them where ever they may be. With YipTel, your extension can be delivered to you as a phone on your desk, software on your computer, laptop, or on your Smartphone or Tablet. This provides an unparalleled level of flexibility as you can now connect how, when or where you choose. We like the fact that our service is not your typical phone system; it is a business communications solution that connects you to your clients and your coworkers virtually anywhere. Simple and easy communications. Here are some of the features available with our mobile application. In the YipTel Mobile application you can dial from your mobile device but show the office phone number vs your cell phone number. 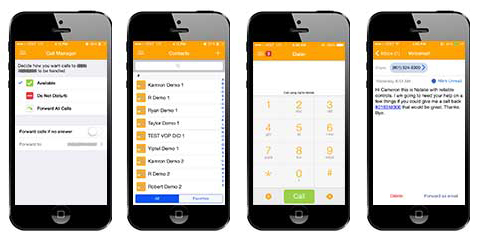 Our dialer on our mobile application provides calls over your data connection with your deskphone caller ID as if you were in the office. If for whatever reason your connection fails or lags, we have a conveniently located switch button which, in times of bad connectivity, will place the current call on hold before calling back the participant over your cellular connection thus preserving the call. 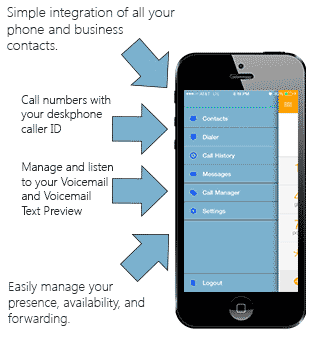 The mobile application also allows you to manage your incoming calls and call forwarding. This allows you to be in complete control of your calls and better connect on the road with your clients and coworkers. With the YipTel Mobile application, you have the ability to integrate your existing business contacts with your phone contacts. These listings will appear conveniently within the YipTel mobile contact browser for you to call. Consistent with the Desktop client application comes to the ability to video call other coworkers across mobile or desktop devices.